To make the sauce, combine all the gooey bits ingredients in a medium saucepan over medium heat and stir until well combined. Pour the sauce into the bottom of an ovenproof pudding basin (mould). In a blender, whisk the eggs for 5 seconds. Add the remaining pudding ingredients and blend to combine. Pour the pudding on top of the sauce. 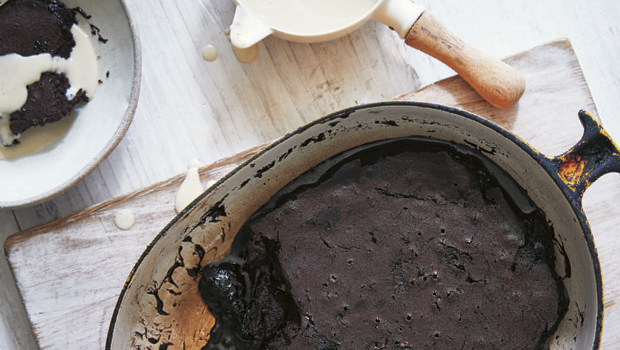 Don’t panic, the gooey sauce will come up around your pudding batter, which is totally normal and even perhaps awesome. You’ll see! Bake for 20–30 minutes, until the pudding springs back when you press the edges but is still quite soft in the middle. When you test the centre with a skewer, there should still be a little pudding on it. Worst cake scenario is you get a cakier result if you take it a few minutes too far. You’ll still get a bit of gooeyness from the sauce around the edges and underneath. Note: Arrowroot flour is often preserved with E220, so check. For a denser pudding, replace the tapioca flour with 90g of buckwheat flour or 70g of almond meal (only if the recipe doesn’t need to be nut free). If using a thermocooker, make the sauce for 2 minutes on speed 3, 100°C. There’s no need to clean the bowl before whisking the eggs for 5 seconds on speed 6, then the remaining ingredients for 6 seconds on speed 5. 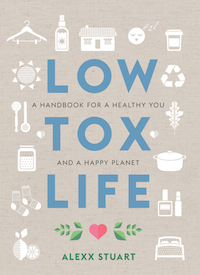 Images and recipes from Low Tox Life by Alexx Stuart, Murdoch Books, RRP $35.00. Photography by Rob Palmer.